The US has lost millions of acres of productive farmland in the last decade to urban sprawl. Researchers say state and county officials are seeing smart growth plans circumvented by politicians in small cities. The Great Lakes Radio Consortium’s Lester Graham reports. Most states have passed legislation or are looking at doing so to reduce urban sprawl. Even some counties are working to restrict development to certain areas. But often developers approach small cities, promising increased tax revenues and infrastructure if the town annexes large areas of surrounding land for the developers. Rich Green is a geographer at Northern Illinois University. He says some small town officials don’t see past their own city limits. And so long debated plans to manage growth become nothing more than lines on a map, while natural areas and farmland are replaced by subdivisions and parking lots. 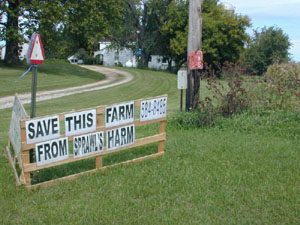 Green says that’s led to eleven million acres of prime farmland being taken out of production in the fertile Midwest and East in a 15 year period due to urban sprawl. For the Great Lakes Radio Consortium, this is Lester Graham.